While the last 2 months were a hiatus from the website and blog, cheese managed to cross our paths many times. On a 12 hour layover in Istanbul, we happened upon a trove of cheese we never noticed before. It was hiding in one of the most trafficked areas of the city, the Spice Market. After a 6am breakfast of hummus, Turkish coffee, and shisha, we watched the sunrise from the Galata Bridge. The nearby Spice Market was setting up for the day. Vendors organized their spices, sweets, and wares. 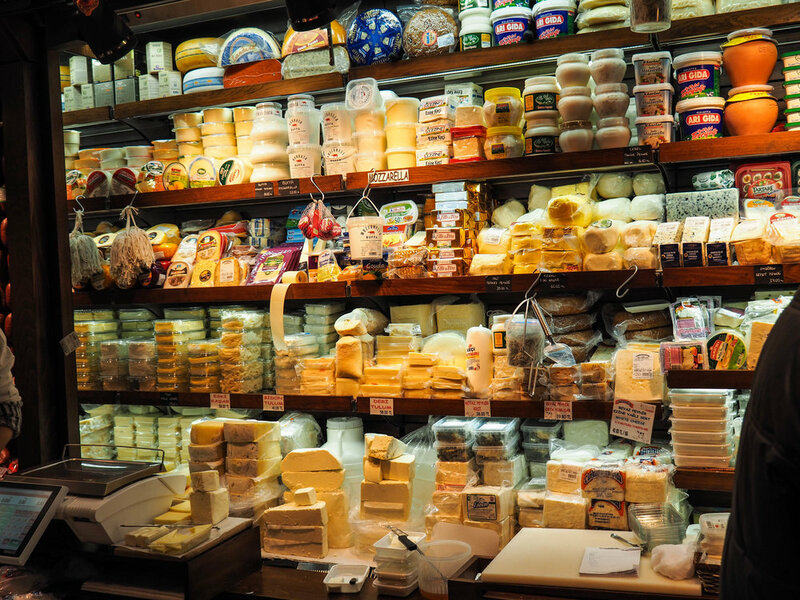 Among the store fronts was a surprising number of cheese vendors. Each was selling massive chunks and wheels of cheese that I couldn’t recognize. Most of what I know about Turkish cheese comes from what I’ve eaten in the country. That includes a lot of yoghurt and fresh white cheeses similar to feta that top salads and many meat dishes. Each region also has its own unique touch, including many aged cheeses. One unique cheese in the Spice Market is made of sheep’s milk and aged in the skin of a goat. It was a little strange with a strong gamey flavor. It was alluring at nine in the morning. After the cheese tasting, it was time for a third breakfast course and a palette cleanser. This was best done with another cup of Turkish coffee, the best cure for jet-lag, at a local pastry and bread shop. The coffee arrived alongside a plate of warm, cheesy borek, a flakey Turkish pastry as addictive as they come. With time to spare and a bolt of caffeine, the last step before another long plane ride was a visit to the hammam.